If you are looking for relief for constipation, chances are you are considering one of the most common remedies for this widespread condition – psyllium husk fiber. So, how does this natural bowel content transporter work, and, is it as effective as you may think? We’ll give you the skinny on how and why psyllium husk fiber works and its side effects, which will help you decide if this insoluble fiber supplement is right for you. You would think that adding more mass to an already clogged colon would be a bad thing, but psyllium benefits include increasing bulk in the stool but also escalating the amount of water in the stool. What this means is that the end result is a formed and soft stool that is easy to pass. Psyllium husk fiber also stimulates excretion, kick starting the intestine if you will, which provides relief particularly if you have been unable to go to the bathroom. So, how does psyllium husk fiber work? Well, the mucilage content of psyllium is the key mystery ingredient. Mucilage acts as a gelling mechanism, which explains its frequent use as a relief for constipation. Interestingly enough however, while psyllium husk fiber is a very popular remedy for the occasional back end blockage, it’s actually much better categorized as a big winner for people on high fiber diets as it is a true dietary fiber. In fact, it’s also used in animal feed as a good source of nutritional goodies for cattle and chickens. If the uses of psyllium husk stopped simply at constipation relief, it would still be a genuinely valuable product, however recently, more and more we are seeing psyllium turning up in foods as well as in the medicine and supplement aisle. Why is this? Because there are studies that have suggested that incorporating psyllium husk into your diet can be an effective means of reducing cholesterol, and for people who are looking for healthful ways of doing that, a psyllium fortified cereal may be just the ticket. 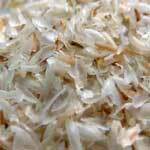 There are the occasional downsides to consider when using psyllium husk fiber however. Gas and stomach cramping are both commonly reported psyllium side effects. These however are normally mild and typically subside rather quickly. One other potential downside to consider is that it’s possible that relief of constipation may not come with this product for as much as 1-3 days. As such, it may not be an ideal option for people who are seeking a very quick remedy. Overall, psyllium is a great choice for those who are looking to relieve occasional constipation, supplement their diet with a tad more fiber, or even potentially lower cholesterol with this high powered plant. It’s easy to use and you can choose between an oral supplement, powder that gets mixed in with food, or even foodstuffs that are fortified with this potent plant product. It’s low incidence of side effects make it more appealing to people who elect a more natural healing method, and it’s gentle laxative properties make it attractive to people who don’t want their constipation to come to a violent end and prefer instead natural and gentle relief.